Free size that adjust by the button site.Choose different color to change mood in daily life. Nice replacement accessories for Fitbit Flex wristband. Large Size:6.3-8.3 Inches / 161-210 mm. Band Width:0.6 Inches / 13.9 mm. Small Size:5.5-6.9 Inchs / 140-176 mm. Band Width:0.6 Inches / 13.9 mm. Silicon Fastener Ring for free - Fix the Clasp Fall Off Problem. But it does NOT fit other activity trackers or wristbands. 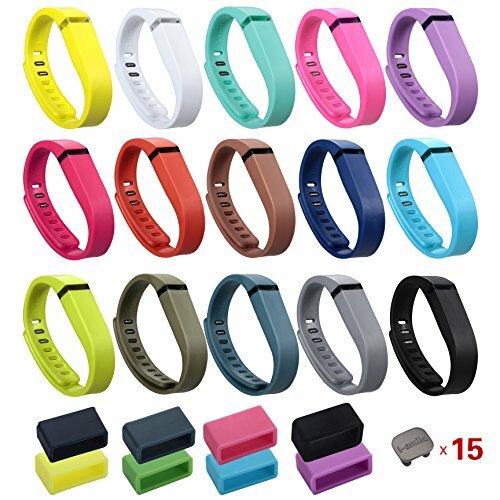 15pcs Replacement Bands with Metal Clasps for Fitbit FLEX Only /No tracker. More colors are available:Red,Bright Blue,Yellow,Rose,White,Black,Lime,Violet,Navy,Pink,Orange,Magenta,Slate,Teal,Dalmatian,American Style,Camouflage Color; Size:Small & large; More combinations,Please search in our store! If for any reason you are unhappy with any product by I-SMILE, please feel free to contact us. We take full ownership and responsibility for the quality of our products and will do our very best to solve your problem quickly and efficiently! I-SMILE is a registered trademark protected by US Trademark Law. If you have any questions about this product by I-SMILE, contact us by completing and submitting the form below. If you are looking for a specif part number, please include it with your message.